Northern Georgia Christmas Tree Farms: choose-and-cut Christmas trees, Tree lots with pre-cut trees, stands, sleigh rides, hay rides and related winter events and fun! Whether you want to cut your own tree, pick a live tree and have it cut for you, buy a tree already cut or buy a living tree you can plant, this page provides detailed listings of Northern Georgia's choose-and-cut Christmas tree farms, places to buy pre-cut (also called pre-harvested and fresh-cut) trees, stands, sleigh rides, hay rides and related winter events and fun. Some listings are for tree farms, others are tree lots, and some only offer hay rides, sleigh rides or other winter events. READ EACH LISTING to know what each facility offers. The farms are listed further down this page, so scroll down the page! Since this service is free and open to ALL Christmas tree farms, not just those who belong to an association or pay for an ad, like almost all other websites do, this is the most complete and current listing available! I'm always looking for more to add, and to correct any inaccuracies or errors, so if you encounter any, please email me ! And please tell the farmer you visit in Northern Georgia that you found their farm here! I need the farmers to realize that you found them here so that they will keep their information up to date! 985 Salem Valley Road, Ringgold, GA 30736. Phone: 706-935-3563. Open: from. from November 25 to Christmas, until Christmas, 7 days a week, 10 am to 5:30 pm. Directions: Take I-75 Exit 345, Ringgold - Tunnel. Go one mile North on Hwy 41, turn right on Salem Valley Road. The farm on your left. From Ringgold - go South on Hwy 41 four miles, turn left on Salem Valley Road. The farm on your left. We sell Wreaths and Tree Stands. Click here for a link to our Facebook page. Comments from a visitor on November 29, 2008: "A great Christmas tree farm. Lots of sizes and varieties to choose from. Any tree on the lot was just $35. They have farm animals to pet as well. Horses, sheep, a pig, goats, and llama. The kids had a great time. The owners were very friendly and helpful." 55 Lawrence dr., Dawsonville, GA 30534. Phone: 770-380-3636. Fax: 706 2651447. Email: bradspumpkinpatch@alltel.com. Open: Friday after Thanksgiving through December 23rd; Monday to Thursday from 1 pm to 6 pm; Friday and Saturday from 9 am to 6 pm; Sunday from 1 pm to 6 pm. Directions: We are located just 8 miles North from the Dawsonville Square on Highway 183 at the 5 mile marker. From the Dawsonville Square take Hwy 53 West to Highway 183 North (right). Continue on Hwy 183 to the 5 mile marker. We are located on the left; look for the signs! And for a map to our farm, click here. Also have old-fashioned cooking pumpkins thru Thanksgiving; Daffodils: first weekend in March. Payment: Cash, Check. Heritage daffodils (pre-civil war) and daylilies beginning last weekend in February for daffodils and end of July for daylilies. Christmas tree varieties: PreCut varieties: Fraser Fir. 9945 Lakewood Highway, Mineral Bluff, GA 30559. Phone: 706-374-1234. Email: thepodunkman@hotmail.com. Open: We open the day after Thanksgiving for the Christmas season. Directions: Highway 515 North, Left on Highway 60, two tenths of a mile. Click here for a map and directions. Local peaches May through September; Homegrown tomatoes June through October; Georgia Rattle Snake watermelons July through September; Giant cantaloupes arrive from Cordele Georgia in May Vidalia onions arrive third week in April; Local apples come in June; Boiled Peanuts and Pork Skins year round. Payment: Cash, only. 76 East Troutman Road NE, Rome, GA. Phone: 706-232-9819. Open: from November 20 to Christmas, daily, 9 am to 6 pm. U-Choose & Cut your own: White Pine,. 226 Spur 101 Se, Silver Creek, GA 30173. Phone: 706-295-5557. Email: wyattlfc@aol.com. Open: Monday through Friday from 4 to 6 pm;. Saturday' from 9am to 6 pm and Sunday from 11am to 6pm, from the Friday after Thanksgiving to Christmas. Directions: 2 miles south of Rome off Highway 101. And for a map to our farm, click here. Payment: Cash, only. Click here for a link to our Facebook page. You-Choose and You-Cut varieties: Eastern White Pine, Leyland Cypress. 1581 Ga. 197 north, Clarkesville, GA.
276 Woodland Lane, Dahlonega, GA. Phone: 706-864-8222. Open: UPDATE: December 13, 2018: Sold out of trees; They are closed until next season (2019), when their hours should be: from November 20 to Christmas, Closed Monday, Tuesday to Saturday, 10 am to dark; Sunday 1 pm to 5 pm. 753 Highway 515 South, Jasper, GA 30143. Phone: 706-692-9064. Email: jason@hemlocks1.com. Open: Monday to Friday 10 am to 7 pm, Saturday 8 am to 8 pm, Sunday 10 am to 6 pm from Thanksgiving Weekend to December 23. Directions: Located 1 mile south of Highway 53 on Highway 515 in Jasper across from Shottenkirk Ford. Click here for a map and directions. Payment: Cash, Debit cards, Visa/MasterCard, Discover, AmEx. Visit us this Holiday Season to explore our premium selection of Fraser Fir Christmas Trees.We are a Family Owned & Operated Business that prides itself on providing premium quality trees and friendly service. Our trees are shipped directly from the farm to our lot. We immediately make a fresh cut and display our trees in water reservoirs to ensure that you are getting the freshest tree possible. Click here for our Facebook page. 375 Carver Mill Road, Talking Rock, GA 30175. Phone: 706-692-3261. Email: jbarnes@etcmail.com. Open: from the day after Thanksgiving and the next 3 weekends, Satuirday and Sunday from 10 am to 12 pm and 1 pm to 5 pm. Directions: From the intersection of Hwy 515 & 53 in Jasper, travel West 7 miles on Hwy 53, Farm is on left. Phone: 706-746-6952. Open:UPDATE for 2018, They may have closed; Does anyone have current information, are they still in business and open? If so, please write me, their last reported hours were from November 25 to Christmas, Monday to Thursday, 12 pm to 5 pm; Friday to Saturday, 10 am to dark; Sunday 2 pm to 5 pm. U-Choose & Cut your own: White Pine, Balsam Fir. 5030 Hwy. 441 North, Rabun Gap, GA 30568. Phone: 706-746-6952. Open: UPDATE: December 14, 2018: They are closed until next season (2019), "Due to the amount of snow in the tree fields we are not able to cut any trees; therefore the choose and cut and pre-cut lots are closed for the 2018 season. "; see them in 2019 when their hours should be: 9 am to 4 pm at the CHOOSE & CUT LOT and 9 am to 5 pm at the RETAIL LOT (cut trees)) through the second weekend in December. Click here for a linkto our Facebook page. Do you know of any Christmas tree farms or other special Christmas and winter events in this County? Please tell me about them - Click here to write to me! 2226 Owltown Rd, Blairsville, GA 30512. Phone: (706) 745-0601. Email: stpfarm1@gmail.com. Open: UPDATE: December 14, 2018: Sold out of trees; They are closed until next season (2019), when their hours should be: See our website for current hours. Click here for current open hours, days and dates. Directions: Located 4 point 7 miles south of Blairsville, GA off of Highway 129. Click here for a map and directions. Payment: Cash, Visa/MasterCard. 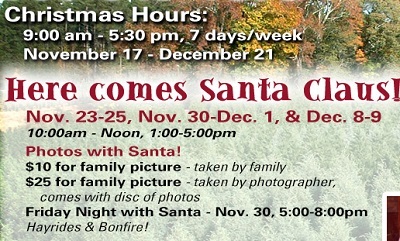 Santa Claus will be here and ready for pictures with you, your family, and friends. Come down and visit the Plantation. 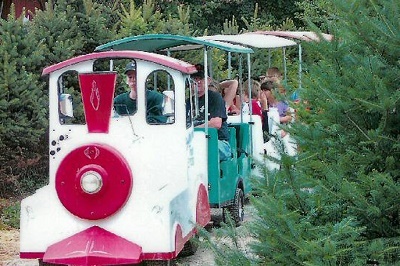 Hayrides: We invite you and your family for some fun riding experience on our brand new miniature train. The train runs on a road track and is just the right speed for youngsters. Marshmallow Roasting: Tell a few tales while roasting those yummy marshmallows over our open fire pit. Pony Rides: For the younger buckaroos, we have fun in the form of our quiet loveable ponies.. Hayrides: This is not an average hayride. Our enjoyable long-lasting hayrides will take you over 60 acres of beautiful Plantation land with breathtaking mountain scenery. Also, an enchanting river and a creek that meanders through the Plantation. And, of course, our thousands of Christmas trees. Many surprises and things to see along the way. Put your old jeans on and join us for the fun. U-Choose and Cut varieties: Blue Spruce, Canaan Fir, Fraser Fir, Norway Spruce. 1713 North Long Hollow Rd Chickamauga, Ga. 30707. Phone: 706-861-5672. Email: drtreeboss@aol.com. Open: UPDATE for 2018, Their website is gone; Does anyone have current information, are they still in business and open? If so, please write me, their last reported hours were starts 2:30 pm Thanksgiving Day, 2:30 pm- 5 pm weekdays; 8:30 am to 5 pm Saturday. Closed Sunday. Directions: Take the new U S 27 Park Bypass to Longhollow Road, Turn West 1 and a half miles. Look for signs. OR Take Mission Ridge Road to Longhollow Road, Turn East 3/4 mile on the right. 7206 Highway 95, Lafayette, GA 30728. Phone: 423-838-5785. Email: treefarminfo@gmail.com. Open: Check their website for this year's Santa visits; Thanksgiving day from 1pm till dark , Friday after Thanksgiving 10 am till dark Saturday 10 am till dark; Sunday from 1 pm till dark then Mondays through Fridays from 12 pm to dark; Saturday from 10 am to dark and Sunday from 1 pm to dark thru last weekend before Christmas. Directions: Click here for a map and directions. Payment: Cash, Check, Debit cards, Visa/MasterCard. Everyone welcome to bring your family and have fun picking out your family Christmas tree. This is all about enjoying your family and remembering the true reason for the season. You-Choose and You-Cut varieties: Carolina Sapphire, Deodara Cedar, Leyland Cypress. You Choose and We cut varieties: Carolina Sapphire, Deodara Cedar, Leyland Cypress. 654 Kensington Road, Chickamauga, GA 30707. Phone: 706-375-2729. Open: Monday thru Friday from 5 pm until 6 pm, Saturday from 9 am until 6 pm, Sunday from 12 pm until 6 pm. Directions: From Chickmauga, go South on Hwy 341 4 miles, turn right on Kensington Road, farm is 1/4 mile on right. Phone: 706-638-7041 or 706-236-1329. Open: from November 25 to Christmas, Monday to Friday, 4 pm to 6 pm; Saturday 8 am to dark. ; Sunday 1 pm to 6 pm. U-Choose & Cut your own: Leyland Cypress, White Pine, Cedar . 2572 highway 95, Rock Spring, GA 30739. Phone: 706-764-6111. Email: dantheman@windstream.net. Open: starting Monday after Thanksgiving to the weekend before Christmas on Monday through Friday from 3 pm to 6 pm; Saturdays from 10 am to 6 pm; Closed Sundays; closing on December 22; NOTE that Santa photos scheduled for Saturday, December 15, 2018 have been canceled; Please see our web page and follow us on Facebook. Directions: 2572 highway 95, Rock Spring, Ga 30739 is physical location. 2.5 miles Southeast of Rock Spring on highway 95. Only minutes from Chattanoga, Ringgold, Chickamauga, and LaFayette. Click here for a map and directions. Payment: Cash, Visa/MasterCard, Discover. You-Choose and You-Cut varieties: Carolina Sapphire, Leyland Cypress. You Choose and We cut varieties: Carolina Sapphire, Leyland Cypress. 1237 W. Walnut Avenue, Dalton, GA 30720. Phone: 706-529-6584. Email: fiddleheadsdalton@gmail.com. Open: Monday to Friday 9 am to 6 pm; Saturday 9 am to 5 pm November 21 to December 24. Click here for current open hours, days and dates. Directions: I-75 North to Exit 333. Go east on Walnut Avenue for 0.5 miles and turn right on Dug Gap Road. Fiddleheads will be on the left behind Wal-Greens. Click here for a map and directions. Fiddle Fest (fall festival) Saturday, October 12 includes fresh made fried apple pies, BBQ, Brunswick stew, Pumpkin painting; Christmas Event (check our Facebook page for annual date) - bonfire with homemade smores, make your own Ornament, wreath decorating, early Christmas tree selection. Payment: Cash, Check, Debit cards, Visa/MasterCard, Discover. Made in Georgia gift shop, shrubs, trees, annuals, perennials, grasses, pottery, flags, and much more. Living, rooted tree varieties: Carolina Sapphire, Deodara Cedar, and other varieties (call!). Wheeler's Christmas Tree Farm - Christmas trees-you choose and you cut, Precut Christmas trees, hayrides, Hot Chocolate, Coffee, Cookies, Fresh Wreaths,tree stands and water spouts. 1144 Dogwood Valley Rd Tunnel Hill, GA, 30755 706-463-1924. Open: Thanksgiving day and Black Friday are 9 am to 6 pm; then until December 19th, we are open Saturday 9 am to 6 pm, Sunday 1 pm to 6 pm, Monday to Friday 1 pm to 6 pm. We offer two varieties of choose & cut trees, the Murray Cypress and Carolina Sapphire. We also have premium fresh-cut Fraser Fir trees. All trees are tagged individually with the height and price of the tree. There will be hayrides every Saturday and Sunday.